We were changing around our media shelves this week and just found our copy of the Wizard of Oz. Hence, I've had the "Lions & Tigers & Bears, Oh My!" refrain in my head for a little bit. 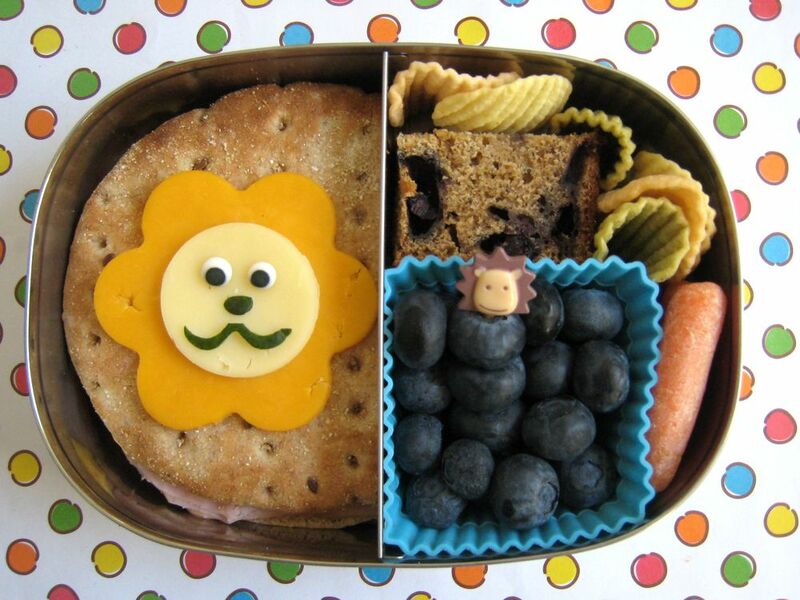 So, the obvious solution to that is to make a lion bento. Now if you remember, the last lion I made looked more like a demented My Little Pony, so this time, I was bound and determined to do better! Ben has a ham & cheese sandwich on multigrain rounds, topped with a cheesy lion. The main is actually a flower cookie cutter, with a round cookie cutter face. The eyes are the little candy ones we use frequently (check Amazon for supplies) and the nose and mouth are bits of cucumber. I did have to trim a thin piece off one side to make the sandwich fit, but for those worried about waste, I ate that piece. It was yummy. The other side holds blueberries and a matching lion pick, a few carrots, a few veggie chips and the last of the blueberry banana bread. We're packed in a Lunchbot Duo for a change, I'm liking it. I think he's cute, looks so happy :) Super yummy lunch! I am going to try this since my son will not eat a sandwich all together...this seems more his style.